Massachusetts Pirates defensive end J.D. Griggs was among the league’s best at his position last season. But he wants more. “With me, everything can always get better,” Griggs said. “There was a lot of plays I left out there last year. 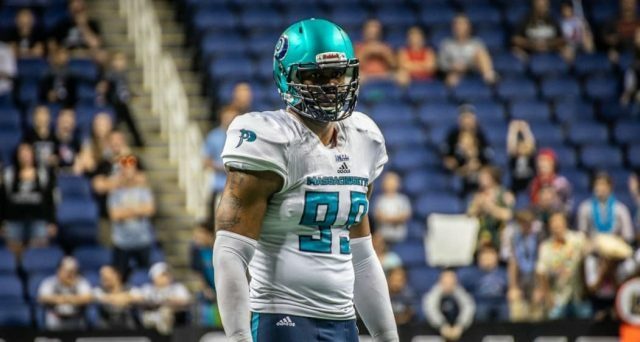 Griggs not only wants to be a better player physically, but now as a seasoned arena league player, he knows he needs to be a leader for the unit. Griggs is setting everything for himself at a higher standard to show all of the new guys the approach they have to take to win. Re-signing with the team in the offseason was a priority for Griggs because of the family oriented way that the team is run on. The Pirates made it to the National Arena League semifinals last season and Griggs now thinks the next step can be reached now with the team at full strength. Griggs in his entire professional career, has never stood at the top and hopes that all can change this year.